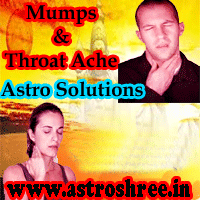 Throat ache astrology reasons and remedies, Mumps astrology reasons and remedies, Powerful ways to over come from Mumps and throat ache, Disease and astrology, Astrologer For Chronic Diseases. In our throat tube or breathing tube there are very small fleshy clots or muscular clots present which are a part of our body immunity system. These are very important as they stop the germs to go inside through nose. In children this type of diseases seen very much. During cold in children the clots become swollen. Ear closed. Children gets problem in hearing, smelling power also gets affected, Meal doesn't get any taste. So it is very necessary to take proper treatment if problem increases. Persons having zodiac sign Taurus Libra, Scorpio are generally affected with this problem if mars come in go-char. If Descendent mercury and Venus is present and 7th place is affected by malefic planets then also this type of problems persist. If birth chart has full mangal gosha or malefic mars then also person suffers from throat ache. Spell rituals to cool down the malefic planets will give benefit to the victim. Right gems stone as per the current position of the birth chart, horoscope or kundli is good. Special rog nivaran kawach or water is good. With medicines if right ways of astrology or occult science is used then intensity of result will increase. This happens when swollen comes in red glands. At initial level swollen seen under ear. Person feels difficulty in eating, swallowing, biting etc. Within 9 or 10 days it gets ok automatically. In case of complication it is good to consult specialist. Malefic mars is the main cause of this mumps. If mars is present with libra then there is a very chance of having this type of problem. 2nd and 8th place of birth chart is also responsible if these 2 places are affected with malefic planets then also mumps arise. Although this diseases gets ok with in a few days but if it affect mainly the proper analysis is necessary of birth chart, kundli or horoscope and then in many ways it can be cured.